Thai Anti-Government Protestors Gather to Begin"Bangkok Shutdown"
Roughly 75,000 protestors have already joined the month-long "Shutdown Bangkok" rally, organized by the People's Democratic Reform Committee. 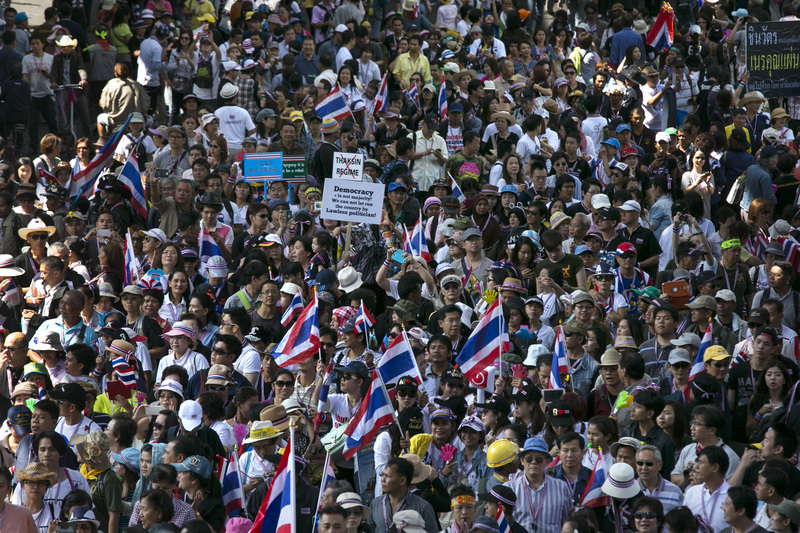 "The goal is to get rid of the Thaksin regime," protest leader Suthep Thaugsuba said Monday. "Yingluck's government is Thaksin's tool, that's why we have to force out her government," referring to Yingluck's brother Thaksin, Thailand's deposed former prime minister. Many of the demonstrators are convinced that Yingluck is having her puppet-strings pulled by Thaksin, who was convicted of criminal corruption in 2008, after which he subsequently fled the country. He's since been living in a self-imposed exile, but a controversial amnesty blanket bill that pushed through the lower house of Parliament a couple of months back sparked fears of his return — protests consequently erupted, quickly growing into a larger anti-government movement that accused the Yingluck administration of vote-buying and corruption, and has since left eight people dead and scores injured in clashes. The movement is also part of a larger tension that exists between Yingluck's supporters — who are mainly poorer and rural — and the wealthier middle class. The Shinawatras have won the last five elections, thanks to overwhelming support from the less wealthy parts of Thailand over their popular poverty-reduction policies, but critics hold on to the memory of the criminal corruption and electoral fraud that plagued Thaksin before his ouster. Polarization continues to be exacerbated by the rhetoric of both sides, further adding to the current unstable political situation. Just over a month ago, Yingluck called for a snap election on February 2 in the hopes of appeasing the quickly escalating demonstrations. But Suthep has rejected the election, on the basis that Yingluck's party would clearly just win again, and the Election Commission — the independent body in charge of organizing the polls — said Sunday that the government should postpone them. Suthep's proposal of an elusive “people’s parliament” or “people’s council” simply isn't feasible. Nor is it acceptable either. The protesters’ dream of a scenario where only the most noble will “elect” from those who are “eligible” the leaders to rule Thailand, is nothing but self-serving and self-selecting personal aggrandizement.